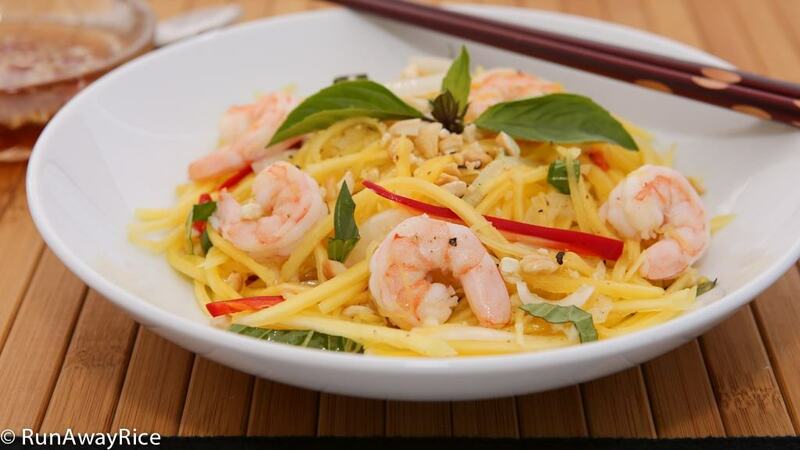 Refreshing and light, this flavorful salad is made with unripened mangoes–which is crunchy and slightly tart, succulent shrimp, fragrant fresh herbs and spicy jalapenos and then drizzled with a zesty and sweet fish sauce dressing. If you love these bold flavors and textures, you’ll want to try this recipe. If you’re familiar with these flavors and drooling already, my work here is done! 🙂 Hope you love the recipe! Unripened (often called raw or green) mangos are bright green and very firm to the touch. Each large mango should weigh approximately 1 lb. A large mango yields approximately 8 oz once shredded. Refrigerate the mangos until you’re ready to use them. This will slow down the ripening process and also keep the texture crunchy. If you just purchased them from the store and want to use right away, soak them in a large bowl of ice water while preparing the rest of the ingredients. The ice water will help improve the texture and make it crunchy. Be sure to remove all of the skin from the mango. The residual green skin can be really tough. I prefer using a mandoline to shred the mango but you can also use a food processor with a shredding blade or julienne by hand. When shredding the mango using a mandoline, if you start to feel resistance you’re getting close to the core. If you see any of the white part of the core, it’s also time to stop shredding and rotate to another side of the mango. The core is very fibrous and we don’t want this in the salad. The dressing has a lot of sugar so it does take awhile to dissolve when stirring. Prior to serving, stir the dressing a few times to remove any settling sugar. If you have time, cook the fish sauce with the sugar to help it melt better. Let it cool and then add the fresh ingredients: garlic, chilies and lime juice. Some people like more dressing than others so I always serve it on the side. This recipe makes a generous amount of dressing. If making this salad ahead of time, combine all of the ingredients, except the fresh herbs, and chill. Just before serving, toss in the fresh herbs and serve with the dressing. Store an remaining portions in the refrigerator. For the best flavor and taste, consume the salad within a day or so. Bring a pot of water to a rapid boil. Add the salt and shrimp. Stirring gently, cook the shrimp until they are pink, approximately 1 minute to 1 1/2 minutes. Transfer to a colander. Spread out the shrimp in the colander and allow to cool. Peel the onion and then thinly slice. Use your fingers to toss and separate the onion pieces. Transfer to a bowl. Add the sugar and rice vinegar and then toss together. Allow to marinate while continuing with the next steps. Cut the jalapenos lengthwise. Remove the seeds and discard. Cut the peppers into thin strips. Rinse the Thai basil with cold water. Pluck the leaves from the stem. Spin dry using a salad spinner or blot with paper towels. Arrange in small bundles and coarsely chop. Remove the skin from the mangos using a vegetable peeler. (Be sure to remove all of the green from the skin.) Rinse with cold water and then blot dry. Shred the mangos using a mandoline. Use your fingers to toss the mangos and separate the shreds. Continue until all the mangos are shredded. To make the dressing, mince the garlic. Add the chopped chilies, fresh squeezed lime juice, sugar and fish sauce. Stir until the sugar is dissolved. 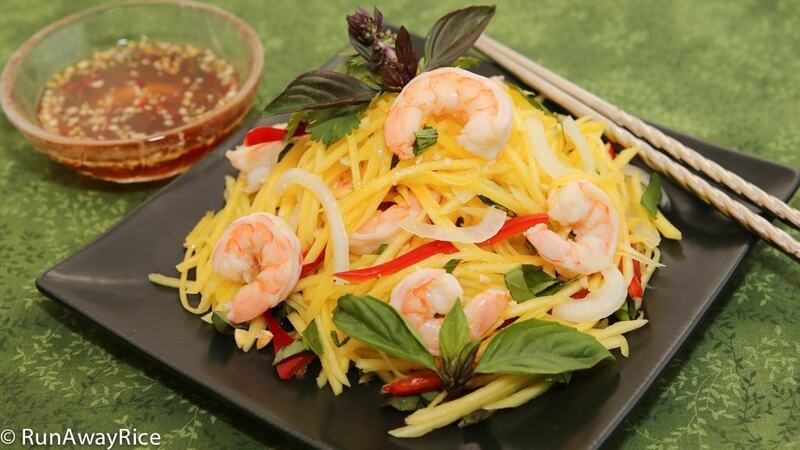 To assemble this dish, add the marinated onions, jalapenos, fresh herbs and shrimp to the shredded mangos. Toss together combining everything well. Place a generous amount on a salad plate. Top with fresh ground black pepper and the crushed roasted peanuts. Drizzle with dressing or serve on the side. Bon Appetit! Want to learn more about the fresh herbs used in Asian dishes? Check out this post: Quick Guide to Vietnamese Herbs. THANKS TRANG, LOVE THE SIMPLICITY OF YOUR RECIPE. I DEFINITELY WILL MAKE IT THIS WEEK. MY SISTER ALSO SHREDDED GREEN MANGO AND USE IT WITH SOME DISHES OR TO MAKE SPRING ROLLS IN PLACE OF PICKLED CARROT/RADISH WHEN SHE DOES NOT HAVE TIME TO MAKE PICKLE. Hi do you have recipe for fish sauce chicken wings? I will have to look. It’s been awhile since I’ve made this.